HOSPICE AND PALLIATIVE CARE. The Essential Guide, 3rd Ed. 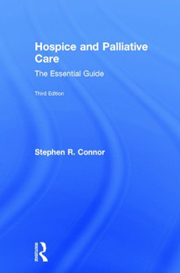 Stephen R. Connor, PhD, is a licensed clinical health psychologist and executive director of the Worldwide Hospice Palliative Care Alliance based in the UK. Wikipedia informs me that he worked as CEO of four US hospice programs from 1976 to 1998, and from 1998 to 2008 was Vice President of Research and Development at the US National Hospice and Palliative Care Organization (NHPCO). The book falls into three sections. The first includes chapters on what hospice and palliative care really means, its history, team functioning, symptom management, and psychospiritual care. The chapter on symptom control is inevitably superficial, but I thought the chapters on psychosocial and spiritual care and on grief and bereavement were enlightening; in particular, he describes the normal nature of most bereavement, which is in contrast to the over-pathologizing recommended by the Diagnostic and Statistical Manual of Mental Disorder (DSM-5). The second section provides an in-depth look at the operations of hospice and palliative care programs, focused primarily on the USA, and challenges facing the hospice and palliative care community. The chapter ‘A Right to Die?’ summarizes the arguments for and against assisted suicide and concludes that it probably makes more sense to define and treat the suffering than simply prescribe a hastened death; along the way are some insightful comments regarding the psychology behind the thinking for and against, in professionals, in patients, and the public at large. The last two chapters address the global development of palliative care and the challenges that remain. He discusses the ‘40-year-old dream’ that by now palliative care would be enshrined in the continuum of normal clinical care and a separate specialty no longer required, which has obviously not occurred. He points to the strengths of the hospice and palliative care movement and how the end of life can become not just something to endure, but also a time for life completion and growth. This is a very good review of hospice and palliative care, although very much focused on the USA. It is written from a slightly different viewpoint—that of an administrator and a trained psychologist. I particularly liked the insightful comments here and there, explaining the psychology behind certain attitudes and behaviors, or why things evolved the way they did. I can see this book being useful in undergraduate courses for professionals and to help orient staff new to hospice and palliative care. Carlo Leget is Professor in Care Ethics and Endowed Professor of Spiritual and Ethical Questions in Palliative Care at the University of Humanistic Studies, Utrecht, The Netherlands. 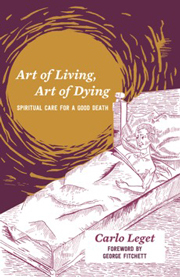 This is an important book for anyone interested in the spiritual aspects of palliative care. Starting with the medieval Ars moriendi (The Art of Dying) tradition, Leget unfolds his ideas for a twenty-first century ars moriendi, one that would better enable both patients and carers to deal with the existential and spiritual questions that occur at the end of life. Who am I and what do I really want? How do I deal with suffering? How do I look back on my life? I thought the book was well written (especially for someone whose mother tongue is not English) but I found the text a bit dense and heavy going. Leget goes to great lengths, using case-based examples, to show how his model is clinically applicable and relevant. What I read made sense, but I thought it might be more relevant to chaplains and pastoral care workers, and I worried whether (as recommended) it was something busy nurses and doctors could take on board. MY FATHER’S WAKE. 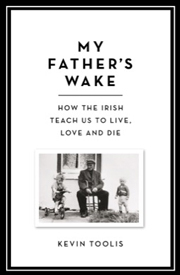 How the Irish Teach Us to Live, Love and Die. This is a long meditation about death. In particular, it is about what Toolis calls the Western Death Machin­e, which has sanitized our culture of any trace of death or dying. It starts with his being summoned to the wake for his dying father in the village of Dookinella, on the island of Achill, off the coast of County Mayo on Ireland’s rugged western coast. Along the way, we hear of his own brush with tuberculosis; his inability to come to terms with his brother’s death from acute leukemia; deaths associated with Ireland’s Troubles; his mother’s sudden death from a heart attack, after which he says the ambulance technicians stole her body; the times when he traveled a lot—Jerusalem, Gaza, Kabul, Islamabad, and many similar places, sometimes dressed up in a burka—and became an expert on terrorism and suicide bombing; deaths in a Sudanese refugee camp; and families dying from the plague of AIDS in Malawi. Toolis has been to some seriously grim places. His heartfelt descriptions of the folk in his family and the island of Achill are wonderful. His descriptions of what happens in the rest of the world are perhaps more journalistic, but snappy and succinct. In the end I was uncertain whether the Irish do something that is special or not. But anyone who works in palliative care in the developed world has experienced Toolis’s Western Death Machine—the collective escapism and denial where death and dying are concerned—and I felt his openness in talking about it was a breath of fresh air. TREATING BODY AND SOUL. 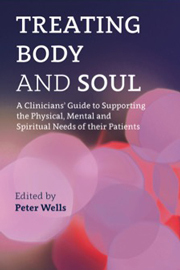 A Clinicians’ Guide to Supporting the Physical, Mental and Spiritual Needs of Their Patients. If you work in palliative care, you are unlikely to argue with the importance of spirituality and spiritual care, be it religious or otherwise, in delivering the best possible whole-person, holistic care. But when it comes to how to talk about it and how to best go about doing it, the results might be more variable. This book includes the opinions and advice from a spectrum of health care professionals, who collectively provide a broad view of the clinical issues. The contributors include a biomedical ethicist, a general practitioner, a consultant psychiatrist, a nurse educator in mental health, a neonatologist, a pediatrician, a therapeutic radiologist, a geriatrician, a nephrologist, a consultant stroke physician, and a nurse and psychologist who work in community palliative care. Peter Wells is an Anglican priest who has worked as a hospice chaplain and is now Lead Chaplain at the Royal Sussex County Hospital in the UK. If you work in palliative care and are sincere about the importance of spiritual matters, you will benefit from reading this book. Perhaps there could be a copy on the unit’s bookshelf, to be shared by both experienced staff and newcomers. DYING TO WAKE UP. 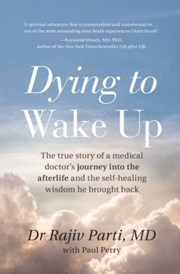 A Doctor's Voyage into the Afterlife and the Wisdom He Brought Back. This is a story of transcendence and transformation that raises a number of interesting questions about the spiritual dimensions of life. By his own description, Dr. Rajiv Parti was a 50-odd-year-old anesthesiologist in southern California who was avaricious, materialistic, competitive, and self-centered (to mention just a few of his faults). He describes his professional life as robotic, and his relationship with his children as wanting. He was dependent on analgesics, antidepressants, and possibly alcohol as well. Then, during the course of an operation for complications of prostate cancer surgery, he suffers a major near-death experience (NDE). Rajiv’s NDE seemed special for a number of reasons. First, he had visions of two previous lives—as an Indian prince in medieval times, senselessly whipping the poor, and two hundred years ago as an Afghani poppy farmer who was addicted to the opium he grew—that led to awareness of explanations for certain aspects of his personality in his current life that he realized he needed to change. Second, is Rajiv’s visit to hell; and it is his father, with whom he had a troubled relationship in life, who saves him from falling into hell and they bond as never before. Then he meets guardian angels and the Being of Light. The second part of the book is about how he comes to terms with it all and doggedly sets about transforming his life. He gave away his mansion, quit his job, opened a wellness clinic, and transformed his relationship with his family. I learned about consciousness-based healing, revealed to Rajiv by the angels, as it is used to treat maladies of the spirit or soul. He calls it remarkable. I certainly had trouble putting the book down. PARTNERS IN PALLIATIVE CARE. Enhancing Ethics in Care at the End-of-Life. 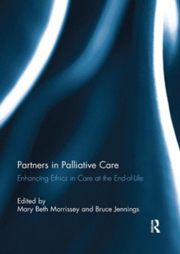 The contents of this book grew out of the 2009 Conference of the Collaborative for Palliative Care, which is in turn described as a grassroots consortium of about 50 public and private organizations dedicated to improving care of the seriously ill through education, research, and advocacy. 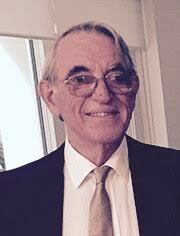 Dr. Morrissey is a social worker by training, associated with the Fordham Graduate School of Social Service. Dr. Jennings is a bioethicist who, amongst other appointments, is a Senior Consultant at The Hastings Center in New York. The book comprises seven chapters, which I felt were well written and thoughtful, addressing specific areas of concern to the Collaborative. These include building community assets to improve palliative and end-of-life care; improving pain management and the relief of suffering; developing inter-professional educational programs in advance care planning and end-of-life decision making; exploring interfaith practice and the issues of religion and spirituality; and, last but not least, the vexing issue of health care costs in end-of-life and palliative care. This book is about how we might improve the whole system. It will be of interest to anyone who works in palliative care, particularly those with responsibilities for administration and planning. The contents of this book were originally published as Vol. 7, No. 1 (2011) of the Journal of Social Work in End-of-Life & Palliative Care.